Since I taunted you in my last post about summer’s sweet whispers and the medicinal hum of air conditioners the weather in suburbia has taken a turn. And by turn I mean a serious nose dive into 40 degree temperatures, rain and the furnace being fired back up. But that hasn’t dampened grillin’ my spirits, nooo siree Bobby. Nothing can hold me back from a fantabulous cookout. Not even Mother Nature. Weather on our side or not, we will indeed be firing up the grill this weekend for our Summer Kick-Off Cookout! I’ve bean (sorry couldn’t help myself) busy sampling all of the delish Grillin’ Beans and have decided on Smokehouse Tradition to accompany my French Provencal marinated flank steak. And guess what? 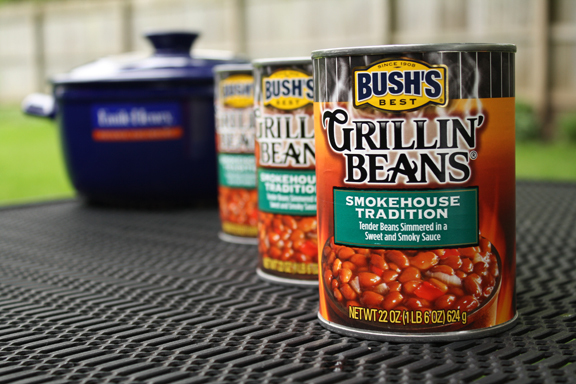 I’ve received my gorgeous Bush’s® Beans Grillin’ kit. And oh my do the folks at Bush’s Beans know how to throw a party. They have so generously put together a grillin’ kit that includes a beautiful dutch oven by Emile Henry. This lovely dutch oven can be used on the grill by the way! How cool is that? as well as a darling can opener that comes in very handy when opening a can (or many cans) of Bush’s Grillin’ Beans ( just sayin). And if that isn’t enough to put a smile of your face, there is a $50 Visa gift card included in this fabulous grillin’ kit! Are you smiling now? I sure hope so! 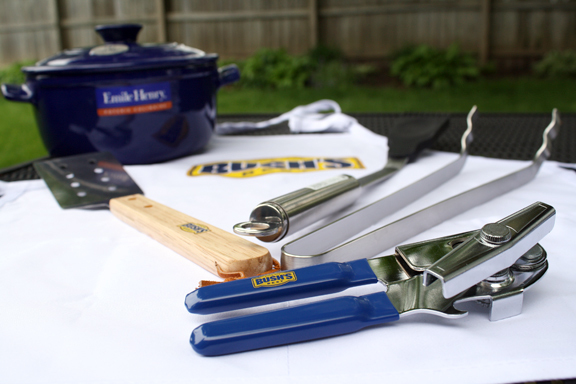 Be sure to stay tuned because next week I’ll be sharing all the delicious fun we had grilling, eating (perhaps even singing) and you’ll get a chance to throw your hat in the ring to win one of these fabulous grillin’ kits that Bush’s is so generously providing! Until then I’ll be busy doing my cold-rain-go-away-sun-will-come-out dance while setting the table with my favorite antique blue transferware dishes and fresh flowers. Not all at the same time of course. Disclamer: The cookout and giveaway are in partnership with Bush’s Beans. However my opinions, thoughts and photos are 100% my own. You are just too cute Miss Wendy. I look forward to more grillin posts from you!! How fun! I love that you can put the pot right on the grill…that’s great! I can’t wait to see what you pair these beans with…and that pot is gorgeous! I am so excited to see the results! Sounds like a great time. And I feel you girl, this weather is just not up to bbq-ing standards – where is the sun? Even in Southern California! My brother in law would love this, he’s quite the griller! Love the colour of that dutch oven and keeping my fingers crossed that the sun comes out by the weekend. We’ve been having so much rain here and some rays would be a very welcomed change. Happy Grillin’ though, rain or shine. Beans taste good in any weather! Payback huh? I think I was surely one you taunted…but no getting you back today. STILL cold and rainy here. Trying to be happy for that since I just got my yard mowed, aerated and fertilized. But I am so ready for a backyard BBQ…can’t want to see what you’re cooking up! Can’t wait for grilling season! i am about to break out a fake sun, load the deck up w/sand, place the deck heaters amongst the potted plants, slather on a fake tan and pretend that i am on a beautiful beach in Cali-four-nye-aye . . . whoever has summer, would you please at least SHARE??? cannot wait to hear about the chance to grab one of those grillin’ kits Wendy – LOVE THAT POT!!! That dutch oven is a beauty of a blue! I’m looking forward to some new bean recipes – yay! That is one purty Dutch oven! Can’t wait to see what you grill up! We are still waiting for our grilling weather to arrive, but all the rain hasn’t stopped us from firing up the barbecue. 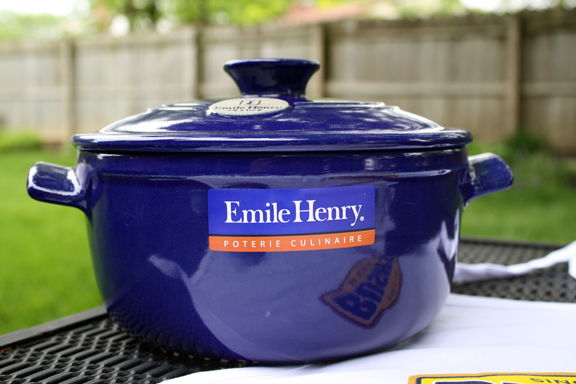 That Emile Henry Dutch oven is lovely! I would use the can opener and Visa Card and my husband would love to try the Emile Henry Dutch Oven on the grill, filled with Bush’s Beans….mmmm I can dream!! Oh my! LOVELY! It all looks great! I love that blue! 🙂 Am I too late? I got the blue one, too. The color is just divine isn’t it! So rich and beautiful. I love your pictures – the angles you chose are perfect. Glad you managed to still have your cookout! Can’t wait to hear more details. Ours has been postponed and I am ever so grateful to those amazing people at Bush’s and Edelman.